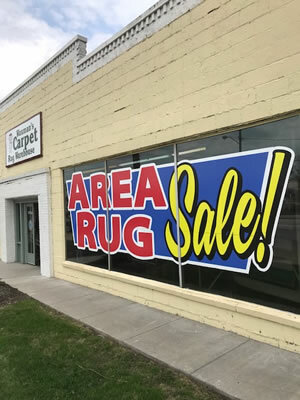 In-store quality carpet, rug and runner binding work, custom size rugs, custom border rugs, carved rugs, and convention carpet are available. Finely crafted, colorful border work is also available for a more decorative carpet installation. You can choose from 100's of carpets in stock or special order and have the ends finished with binding or serging to the size you want. Large to small size rugs are available in the latest colors, styles, and textures. Choose your own beautiful rug! Choose your own size, pattern, and colors. approx. 4' x 6', 5' x 8', and 8' x 10' sizes and other sizes available. Dense colorful area rugs with a border work design. 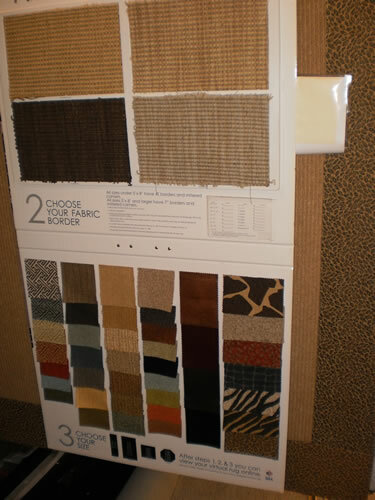 Sisal and custom area rugs with a choice of fabric or leather borders. Shag area rugs, and custom area rugs with quality binding or serged ends. (custom designs and patterns, and contemporary custom design rugs are also available, see store for design examples and collections) New leather and wool design and leather design insert wool rugs in-stock. for your show space & consumer trade shows, own instead of rent and save! Floral Rugs Collection Sizes: 2'6" x 7'9", 2'6" x 11'5", 3'10" x 5'4", 5'5" x 7'5", 7'9" x 10'10"
Nautical, Sports, Flowery, Cowboy, and more. Not valid with any other discount or coupon or in-store specials. No prior sales.